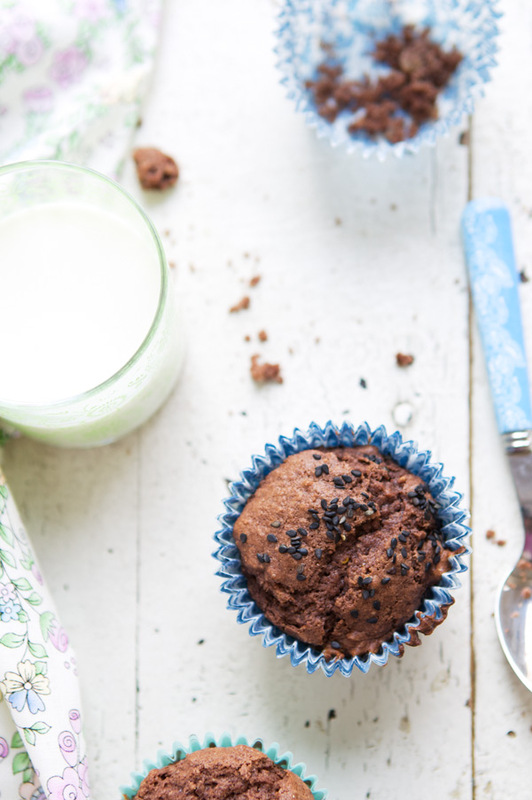 “It’s a muffin packed with ingredients that will make you feel good,” P. said as he was happily nibbling on a muffin with a cup of tea. Actually. I was the one thinking that. Well, I baked them with that purpose in mind. They needed to taste good. Of course. Have a taste of chocolate. Always. And bananas. Moisture, you know? And use flavorful flours full of nutrients. Because I want them to be good for Lulu. And us too. And do you know what? This winter is my first filled with colds and runny noses. I am not used to it. I am told it’s what happens when a little one goes to daycare. It’s real. It is happening. But thankfully, there’s always homemade foods in our home. To eat and feel well. These foods always taste better. Lulu, who helped to bake, was the first one to agree. Oh how much I love my daughter girl! She cooks and bakes with me! It’s an honor for my blog to be nominated as one of the Babble’s Top 100 2011 Food blogs (in the top 10). Look at these lovely blogs. I discovered so many cute interesting ones. Cast your votes. Thank you for your constant support. You make this blog happen too, you know that, right? Preheat the oven to 350 F and prepare 12 muffin cases; set aside. In a bowl, combine all the dry ingredients beside the two sugars; set aside. In the bowl of a stand mixer, combine the two sugars and eggs. Beat until light. Stir in the butter, buttermilk and vanilla extract. Add the mashed bananas. Add the dry ingredients without overstirring the batter. Fill the paper cases and sprinkle with black sesame seeds. Bake the muffins for 25 minutes, or until a toothpick inserted in the middle comes out dry. 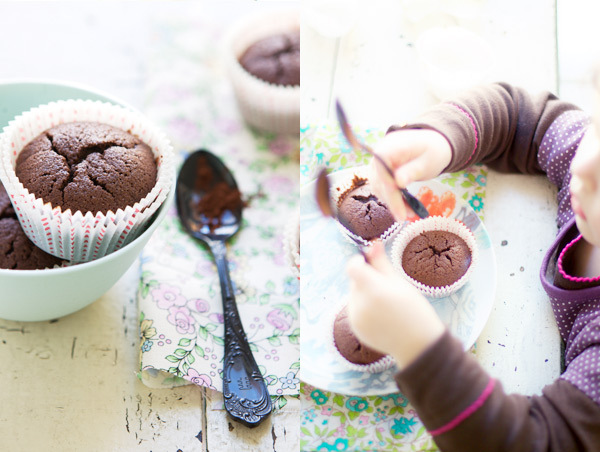 Lovely photos, and so nice that Lulu likes to bake with you! THanks for sharing! I’m sure with all this healthy food, Lulu won’t be sick as often! So lovely and peaceful. What a great helper Lulu is! simply delicious and amazingly introduced and illustrated as ever! I’ve suggested your blog to one of my best friends who recently discovered she has to follow a gluten free diet. YES. cannot wait to try. as i sit here munching my gluten-full bread. even though i usually stay away:) if i had those muffins…. hello bea – wow, lulu’s a big girl now – she cooks and bakes with you! sooo sweet. 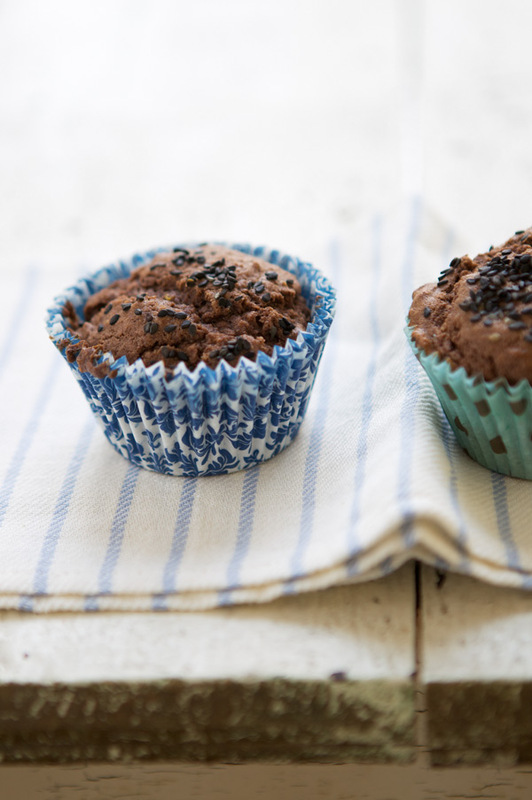 muffins look great as does everything else you make, but those muffin cups are positively gorgeous! you are an inspiration! I love your photos! Looks fantastic and as good on the eyes as it is on the body. Beautiful! Lulu seems more grown up in each new photo! How fun that she helps you in the kitchen. The muffins look great, a must-bake for me. Are there sesame seeds in the muffins as well? Pretty spring flowers. Congratulations on the nomination, well deserved! 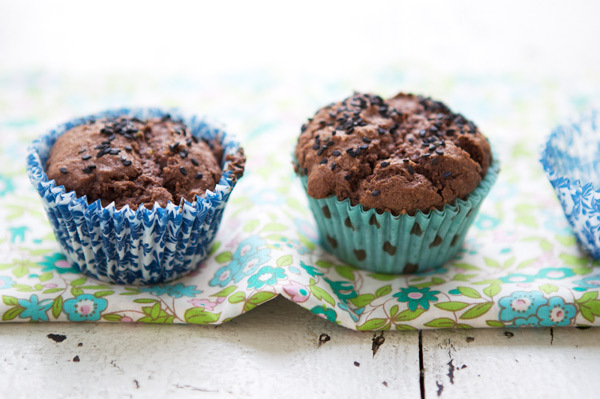 I love the sound of these muffins! Be patient little Lulu, it’s really difficult to separate those paper muffin cups! Now this sounds like a muffin that I would really want to start my day with! I can’t wait until I have kids so I can cook with them. So cute! Your post, your photos, your muffin, your daughter! I´ll try this recipe for sure! I wasn’t able to find your email address but I wanted to let you know that you have been awarded the Stylish Blogger Award! If you post it on your blog, include 7 interesting things about yourself, and choose 10 food blogs that you love for their style to pass the award to. A link back to me would be much appreciated too! Congratulations on the nomination – I’ve already lost myself among the new blogs I’m finding there. I love your pictures – the ones of the flowers above all, they are maybe my favourite type of flower. Bea, I just baked a batch of these as mini muffins, and I am finding it challenging to stop eating them. They are simply delicious. While I don’t have a gluten intolerance (my husband does), I’ve found I prefer the flavors in these blends of flours; particularly teff in sweets. Don’t worry Bea: the first winter at daycare is the toughest. And even though it’s hard on Lulu and you to go through all of these colds and runny noses, it’s the best way to build immunity. There is no doubt that all of your nutricious homemade food will make Lulu more resistant! 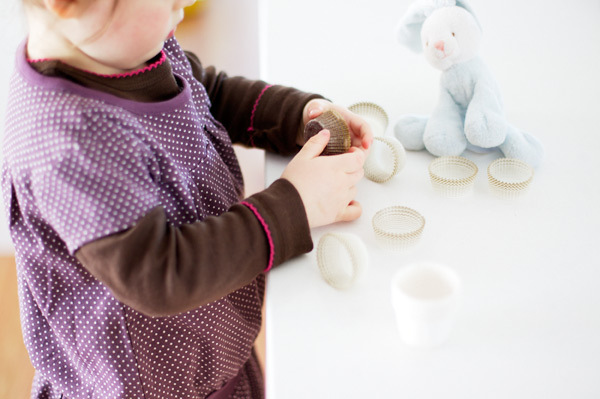 I can’t wait to try your recipe with my older son: he also loves to help in the kitchen! Pictures are gorgeous as usual! Ah, les jolies petites menottes. Pas de doute la petite Lulu tient de toi cette amour de la cuisine. Et bonne chance pour le Babble’s food blog ! Chocolate and banana were just meant for each other. These look great with the sesame seeds! gostaria que colocasse o link do nosso blog de vinho no seu site pois o vinho está internmente ligado á comida. E já agora, tem um belo blog. Parabens. Your weblog is an inspiration and a very enjoyable read! Can I use almond flour in place of rice flour? thanks! Thanks everyone. And thanks for the feedback Victoria and Pardis. Really happy to hear you liked them! The muffins looked so perfect to me! I am so impressed. Really good job! The sesame seeds are so surprising here! How fun! I love the idea of these beautiful muffins. 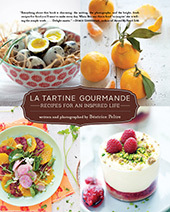 The recipes are appetizing and seems delicious. Hum chocolat et banane toujours une belle association! Et des photos magnifiques! The sesame seeds are a very clever and attractive idea! Will be tested soon. Congratulations on your nomination and thank you for sharing all those precious moments and recipes! First of all: congrats for your nomination, Béa! I really adore your blog. Lulu the little kitchen helper. 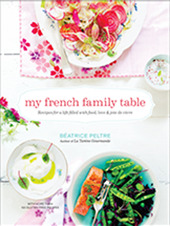 She will be so lucky to have all those wonderful memories being in the kitchen with maman. The muffins look delicious. I especially like the idea with the sesame seeds. If I can’t find teff flour what would be the best substitute? These look delish!!! Very pretty muffin cups!!! Wow, these look amazing! Can’t wait to try them. Thanks for sharing! Sini, can you find buckwheat flour? Hi Bea! Was just trying to vote for you on the Babble Top 100, 2011. Couldn’t figure out how to go about it. Is it the FB ‘like’ that we have to use? oh these look sooo yummy! Can’t wait to try them out. oooh ça a l’air bien bon … aurais-tu la recette avec les poids en mesures françaises s’il te plaît ? merci ! Salut! I’m curious as to the combination of cane and muscovado sugars in your recipe. What might happen if I use only…la blonde? 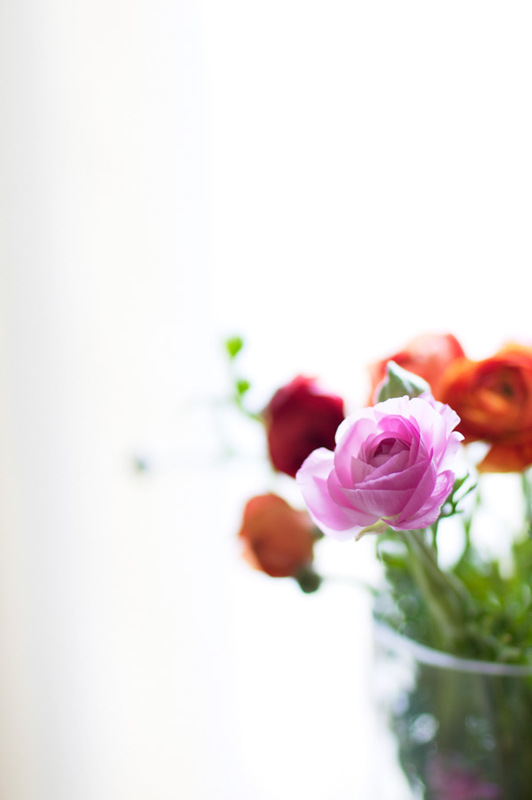 I just stumbled across your blog, and it is so cute! Definitely will be sharing it w/ friends 🙂 This recipe also sounds delectable and has some intriguing combos. I shall experiment this weekend. I am just curious: why no xantham gum? Do these have enough subtance- do they hold their own, shall I say- without it? Thanks Rabah. Yes no xantham gum. I rarely use it in muffins as I often don’t find it necessary. I find that the muffins do have a lovely texture without. If you try, I hope you agree too. I definitely will try w/o xantham then. One more thing I forgot to ask: where I haven’t used teff before, can you describe the inherent texture and flavor of teff and what you think it contributes to GF mixes? It would make my experimentation easier, since I am throwing a lot of variables in at once (this basic template is much different than mine- more butter, buttermilk where I generally use almond milk, and of course the added cocoa). All in all, sounds fabulous. Headed to the market once this Northeast storm blows over! 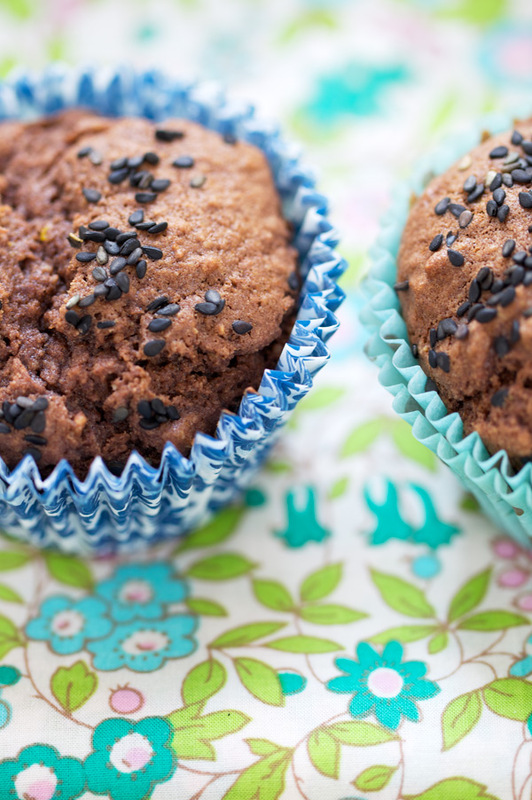 These muffins rose beautifully, were moist, and had a luscious but wholesome flavor. (I couldn’t find teff at my local market, so I tried similar weight amaranth.) I worried about the rise with no starch and so much moisture- but in vain! simply perfect! I made them yesterday evening – finally! I craved for something chocolaty and your cocoa banana muffins popped into my mind immediately. What a treat they are! The first time I used teff flour and quinoa flakes. Love to try out new ingredients.